Hawaii, Big Island, a land that still flows with lava from the active volcano. It has remained one of the few places on earth still making new land. Most of the lava has cooled into coal black surfaces. 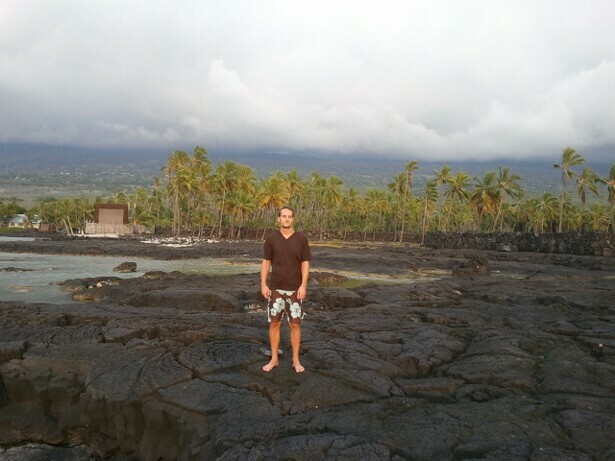 The blackened lava was all over the Kona side of Big Island. It created barriers, tunnels, secret scuba caves, and massive cliffs. Hawaiians have long made use of the lava rocks as stones for the walls of heiau (temples). As I walked into Pu`uhonua o Honaunau, the City of Refuge in South Kona, I was met by an elaborate series of lava rock walls that stood 6-8 feet high. 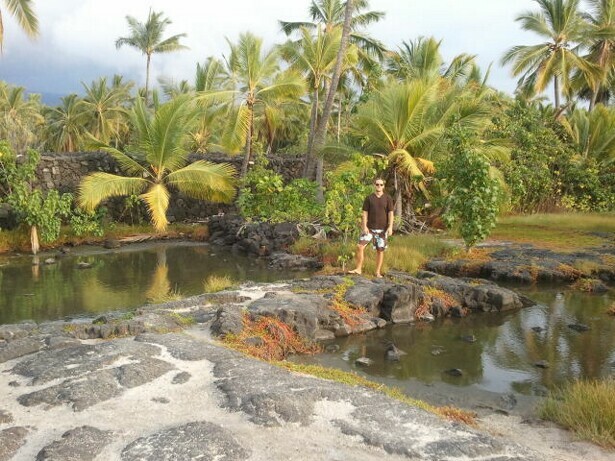 The ground was a mix of lush flowers, sprawling hot tub puddles, white sand, and mounds of smooth black lava. In the distance lay the bay, a playground for honu (sea turtles) and nai`i (spinner dolphins). The crystal clear water revealed a reef with splatters of pink, lime green, forest green, and white. The sea floor was healthy. It was not surprising to learn that the nearby waters are a hot spot for snorkeling and scuba diving. In the old days of Hawaii, a strict system of Kapu ruled the Hawaiian Natives. The English version of the word kapu is taboo, which is used to describe when a social norm has been broken. 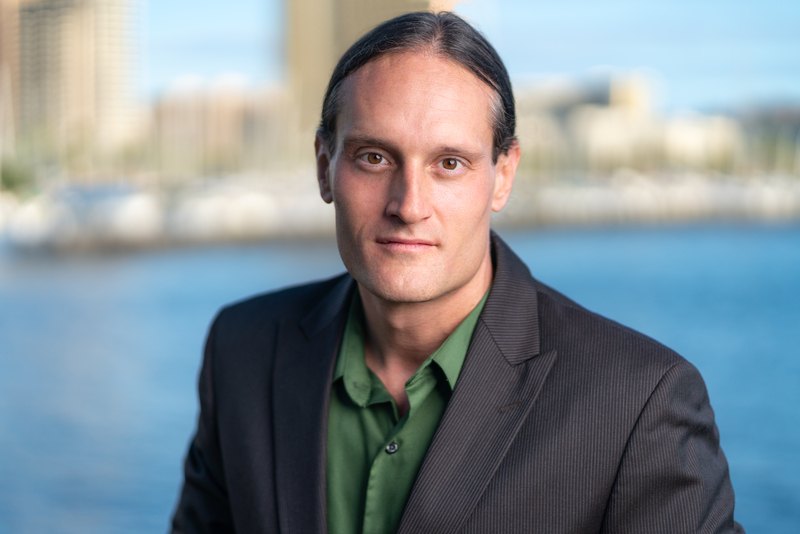 If a Native Hawaiian broke kapu in a serious way, death was one possible punishment for the crime. However, if the lawbreaker made it to the City of Refuge, which often requiring swimming several miles to escape the lower chiefs in pursuit, then they could be absolved for violating kapu. In short, those who made it to Pu’uhonua o Honaunau would live, despite their past mistakes. It was the ultimate safe zone, a place free from war, bloodshed, and retribution. There was no higher authority than to be in the presence of this sacred land, held in the secure hold of the lava walls. My first impression as I walked into the ancient seaside complex was a sense of calm. 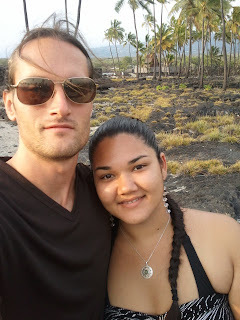 Each heiau (temple) that I have visited had its own character. Being within these walls held a freedom from worry about burdensome details. In the nearby bay, a spinner dolphin popped up and hurdled his body backwards with a splash. Another followed by doing the moonwalk, Flipper style. 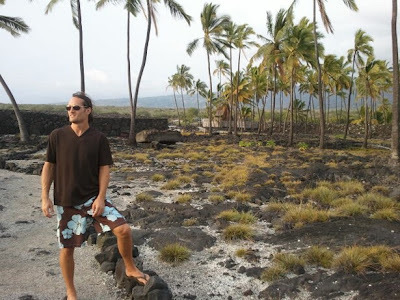 Though the heiau has continued to be a place of serious significance, play was in the air. Bare foot, I felt every nook of the smooth lava which looked like black elephant skin. 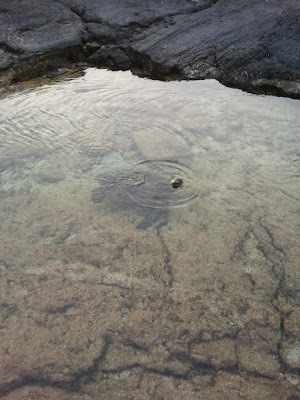 While walking toward the ocean over a frozen sea of lava, a honu popped his head up for a photo. He was in one of the shallow pools which eventually connected with the ocean. Honu found lots of lovely green stuff to eat off the coral, then cruised back towards the sea. I stood for a moment on an ice cream scoop mound of cooled lava. Thoughts seemed less significant, as the awe of the land took over. Memories passed through my mind rapidly, as if there were an old projector in the front of my head. The memories were scenes with ex-girlfriends. I had broken their hearts, and the movie memories were of heartbreaking goodbyes. Covert blisters of old feelings came to the surface, popping out of my chest and stomach. They rose up like intense waves and left like shore splashes. Yes, I have hurt people that I love. The greatest of this pain started with dreaming, that vulnerability that comes with sharing dreams of a future together. Then, the painful twinge, the realization that the fights were the same and something in my tired heart said we were done. Our lives moved in different directions and it was time to stop holding on. In these painful partings, I had to choose myself first, choose where life was taking me.This also meant accepting that life was taking a former partner in their own direction. That choice to surrender, to let go, meant breaking our spoken promises. It meant releasing “forever” and “life partner” and “children”. To keep faithful to my truest longings, I had to break the promises made in more enthusiastic times. 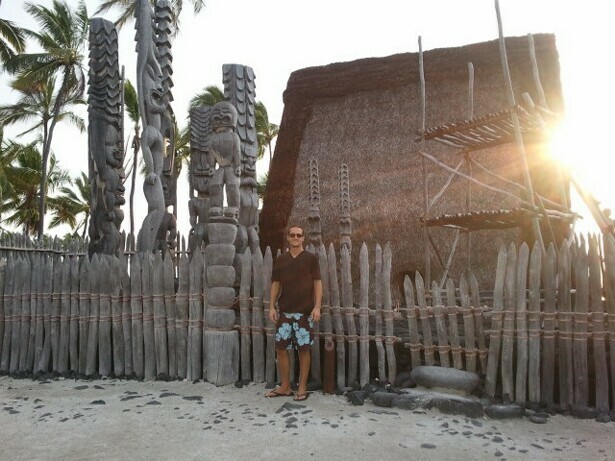 Somehow, the walls here at Pu’uhonua o Honaunau facilitated the release, made it more gentle. Part of me was waiting for a place like this to let it all go. As the old pain from hard choices left my body like unseen phantoms, there was room to breathe again. A pocket of self anger came up, making my face flood red. How could I be so charismatic in my promises, and then leave? The neck breaking tightness of self expectation squeezed hard. How could a Healer wound someone they love in this deep way? Then, an insight arrived. I have always been a man first. I’ve always been a human being learning from others. Being a Healer is built on that platform. Whenever my humanity shakes, the Healer stumbles but does not crumble. Rather, the shaking was essential in the way a sculptor must cleave away the surface of an emerging statue. This humbling insight lead to self acceptance. I did the best that I could do. My new partner, a Hawaiian beauty with cherub smile, has been by my side the whole time. Kaimiola. Her name means Seeker of Life. We walked through the refuge together, sharing steps of our life. The cleansing I was going through was making more room for her to be with me. Her steady presence has accepted me, has trusted me. We stood around a deep cavern in the middle of the lava field. It was a donut hole, filled with clear water and pretty coral, stretching 15 feet deep and 12 feet wide. She stripped off her pareo, pulled up the straps of her bathing suit and plunged into the deep, brisk water of the donut hole. I jumped in after her, consecrated by the cold plunge of salty blessing. Then, forgiveness came. I had forgiven my potential life partners of the past a long time ago. Afterall, I had been hurt too. But this moment of self forgiveness seemed to come last. It was the moment I was waiting for. The future didn’t matter to the cold water on my skin, and the past lost its grip. This moment filled us with joy and laughter, like two crazy kids playing in their big backyard. Two tourists laughed in disbelief at our crazy stunt, then snapped pictures of us like we were two exotic seals. At the very least, they could have fed us some fish. It was my courageous decisions to leave the past which have brought me to this place. I’m grateful to those who have supported me along the way. In this City of Refuge, my mistakes were lessons and my struggles were the rigors of passing through my old wounds. I could see how much I have grown from the past hurt. The wounds were necessary experiences that helped me recognize myself more clearly. By passing through these wounded doorways, I have left the familiar stories of my life behind. The aliveness that I have found was worth it! Check back every other Sunday for the next blog entry. Aloha. My pleasure. Thanks for reading it!